You'd think that here in America we would have a lot more German beers to drink, especially considering how big the beer scene is in Germany. But alas, this isn't the case. You can find them if you are willing to look a bit harder and pay a bit more, but you're not going to find them at the gas station or Walmart... which is a shame. Regardless, here's a German beer up for review. This is the Salvator Double Bock (or Doppelbock) made by Paulaner Brauerei. This brew comes in at a respectable 7.9% and a modest 28 IBU's. Like all doppelbocks, everything in a standard German bock has been amped up a bit. 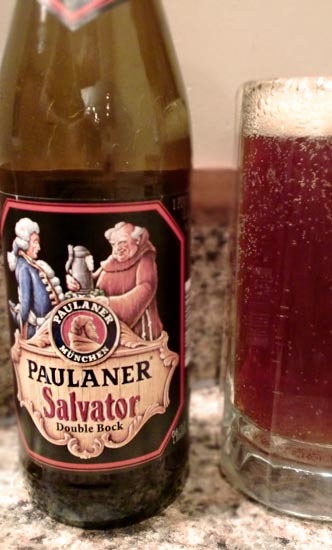 The Paulaner Salvator Double Bock pours a semi-hazy amber brown color with an average light tan head and mild carbonation. It smells of sweet roasty toasty toffee malts and bits of darker wheat bread. Tasting brings strong caramel malts, fresh biscuits, toasted mixed nuts, followed by a vague fruitiness in the finish that's a bit like a Belgian beer. The higher alcohol content is nicely hidden beneath the layers of flavor. This is a very classic style Double Bock. And in that, it's honestly a very solid beer. Is it my favorite Double Bock I've tried? No. But, it's still a perfect representation of the style. If you've never tried a Doppelbock or just want to see what they're supposed to taste like, here ya' go! Drink This: if you want to taste a classic style German Doppelbock. Don't Drink This: if you're looking for one of the newer crazy over-the-top Double Bocks that a few breweries are putting out.